The ultra-nationalist Serbian politician Vojislav Seselj has refused to attend the start of his war crimes trial at the UN tribunal in The Hague. The leader of the Serbian Radical Party, the biggest party in Serbia's parliament, was expected to defend himself against the charges. He has been on hunger strike for two weeks and is said to be getting weaker. 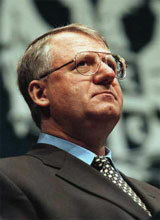 Mr Seselj is charged with forming a joint criminal enterprise with former Yugoslav President Slobodan Milosevic. He also faces similar charges in connection with the fugitive former Bosnian Serb leader Radovan Karadzic between 1991 and 1993. His case is likely to echo that of Milosevic, who died in custody in the tribunal's detention unit in March, says the BBC's Geraldine Coughlan in The Hague. It had been half-expected that Mr Seselj would not attend the first day of his trial, after he began a hunger strike in his cell two weeks ago, and refused to attend a pre-trial hearing last week. He is demanding the right to choose his own stand-by defence lawyer - and unrestricted visits from his wife. Vojislav Seselj is charged with the extermination and deportation of non-Serbs from Bosnia and Croatia, along with his old ally, former President Milosevic. Like Milosevic, Mr Seselj refuses to recognise the court and insists on acting as his own lawyer. His trial has also been delayed because of what the court describes as his disruptive behaviour during proceedings.